Institutional site license ranges from $3,295-3,895 annually, depending on the size of the library collections budget; this price includes membership in HRAF. Lower fees for high schools, small public libraries, Native American institutions and institutions in some countries outside the U.S. and Western Europe are available. See details on the HRAF Web site, http://www.yale.edu/hraf/collections_body_ethnodues.htm. Institutions can save on fees by subscribing together as a consortium. Sponsoring Membership entitles institutions to play a role in HRAF governance; annual dues and fees are $5,450. HRAF (Human Relations Area Files) is a not-for-profit membership research institute located at Yale University. HRAF was formed in the 1940s, as a resource for the cross-cultural study of world cultures. “HRAF” as a product refers to the electronic format here under review and to its earlier microfiche, paper and CD-ROM formats as a whole. eHRAF Collection of Ethnography is a sub-set of HRAF, a largely full-text database of ethnographies including monographs, articles, dissertations and unpublished manuscripts. Some documents are original translations of foreign texts. A companion database, eHRAF Collection of Archaeology was launched in 1999 and is available by separate subscription. eHRAF is intended for an academic audience including working anthropologists and anthropology students. It has a reputation for being difficult to use, for reasons which will be explained. For the modern researcher eHRAF’s initial attraction lies in the fact that so many ethnographies, about 3,500 titles, are in a single place, arranged by culture. Most sources are available in full text; a few documents from early installments to the database include only relevant excerpts from the texts. Though its content is unique, the real strength of HRAF lies in its indexing. The HRAF indexing system is based on two thesauri designed to allow for cross-cultural comparison; one is a list of cultural groups world-wide, the other is a subject thesaurus. HRAF is highly unusual in that every document is indexed at the paragraph level. Since an informed use of eHRAF depends on an understanding of the history of this product, this review explains that history in some detail. HRAF plans to release a new interface for eHRAF in 2008, to be renamed eHRAF World Cultures. A preview of some of these changes follows as well. HRAF makes no attempt to include ethnographies on all cultures of the world. As of July 2007, eHRAF includes 155 cultures. In contrast, the microfiche set includes 355 cultures. Each year HRAF chooses 10-15 cultures from the microfiche set to update and add to eHRAF; each installment of about 40,000 pages includes approximately 60% old material converted from microfiche and 40% new material. HRAF recently decided to speed up this process and complete the conversion of remaining culture files within five years. Sponsoring Members were surveyed for their preferences on which cultures to convert first. eHRAF includes 50 cultures not previously included in the fiche set at all. By fall 2007 eHRAF will consist of about 390,000 pages taken from 3,500 source documents. Cultures included are primarily those that are well-studied so that HRAF can provide in-depth coverage and include source materials spanning several centuries. The largest coverage is for the Navajo culture, consisting of over 27,000 pages of text from 252 source documents. A more typical file is the Wolof culture file, with 3,100 pages from 42 documents. Because some source documents are ethnohistories, the time-span coverage of eHRAF can be said to be historic to the present day. Most sources are monographs and articles resulting from the field research of anthropologists. Other authors include physicians, geographers and linguists. Early materials include accounts from explorers, travelers, missionaries, colonial government officials, soldiers, and other primary sources. Some documents are authored by indigenous peoples themselves. Most titles are monographs and journal articles, but dissertations and government documents are also included. A few documents are transcriptions of folk tales and songs. Nearly all materials are in English—in fact many eHRAF documents are original translations of works originally written in other languages, including French, German, Spanish, Chinese and Russian. An exception to this is transcriptions of folk tales and songs that appear in the original language. Some culture files include an extensive supplementary bibliography compiled by HRAF editors. A summary of the date-range and size of each culture file can be found under “Cultures: All Formats” on the eHRAF collections Web page, http://www.yale.edu/hraf/collections.htm, but this list does not indicate the types of sources included. The HRAF representative was also not able to provide the percentage of source types in eHRAF. Within eHRAF itself it is not possible to browse the source bibliography. Information on source types can only be obtained by viewing the publication information page provided with each source title. A spot-check of 65 source documents from six culture files revealed materials originally published 1886–1998: 28 of these were journal articles, 16 were complete monographs, 7 were extensive excerpts from monographs, 7 were essays, 4 were dissertations, 3 were HRAF-authored bibliographies and 1 was a conference proceeding. Of this sample, 9 documents were translations. Each full-text document is preceded by a publication information page, which includes an abstract and original publishing information. The “long” view of the publication information page also includes a code indicating the occupation of the author and an estimation of the quality of the document as a source. In the past, HRAF attempted to be comprehensive, so documents considered to be less reliable were sometimes included in the microfiche set. The more questionable of these sources have generally been omitted from the electronic set. The spot-check of 65 sources found all documents in the sample to have the highest ratings: 4 and 5. For example, Document 16 is a 1970 article about a village in Kodiak, Alaska. The publication information page gives the date and location of the field work, and the evaluation code Ethnographer-5, indicating that the author, Harumi Befu, is an ethnographer whose work is considered to be an excellent source of primary data. The name of the HRAF analyst who made this evaluation is also included, though there is no indication as to how the evaluation itself was made. eHRAF culture files are not updated on a continuing basis. New material is included annually with each installment of culture files, but HRAF does not retrospectively update culture files that were added previously. HRAF considers each culture file to be a separate edited entity, analogous to an anthology, containing both new and historical materials. For each culture a file description is provided, including the creation date of the microfiche file and its update to electronic format; no new material should be expected after the release of the electronic file. MARC records are not available for individual source titles in eHRAF, but records for the 155 culture files can be purchased from OCLC as a set. Each MARC record includes a complete contents note for that culture, no matter how extensive, thus providing greater access and visibility for eHRAF in the library catalog. HRAF has undergone several format incarnations. HRAF began around 1951 as a set of facsimiles on 5” X 8” cards which arrived in annual numbered installments. This system has continued through the various format changes over the years and continues today, with installments consisting of updates to the electronic database. In the late 1950s HRAF began converting the paper set to microfiche, but microfiche production ceased in 1993. Documents were selectively converted from microfiche to CD-ROM in 1993-2001. The CD-ROM set was, in turn, the basis for the electronic product known as eHRAF. Today, the paper set has been completely superseded by microfiche, and the CD-ROM set has been superseded by the electronic product. Institutions that subscribe to eHRAF and own the complete microfiche set may withdraw the paper and CD-ROM formats, as these have been superseded by the fiche and electronic formats, respectively. Institutions should retain their fiche set for the time being as it is still about twice the size of the electronic product, both in terms of the number of cultures included and in pages of material. Researchers concentrating on a single culture included in eHRAF need look no further. Those who do not find their culture in eHRAF should use the microfiche set, though researchers will need to augment this with other bibliographic sources for more recent material. Cross-cultural comparison requires the use of both electronic and fiche formats. For example, a student looking for transhumance practices world-wide will be able to identify many such cultures in eHRAF, but may find many more by searching the microfiche set also. As mentioned, HRAF operates with two thesauri, the Outline of Cultural Materials (OCM) and the Outline of World Cultures (OWC). The OCM is a subject index of over 700 topics and corresponding 3- and 4-digit codes for each term. These codes are required for accurate searching in eHRAF. The OCM is available online and can be browsed from within eHRAF alphabetically or hierarchically. The 2007 “6th edition with modifications,” will be available online with the new interface to be released in 2008, and it will be updated continuously. At present the 5th edition is the latest available. The OCM can be purchased in paper for convenience in using the microfiche set, since the OCM codes are consistent between the fiche set and the electronic format. An abbreviated Outline of World Cultures (OWC) is also available online from within eHRAF. In print, the OWC has 2944 entries; the online edition has only cultures included in eHRAF. As with the OCM, users can browse the OWC alphabetically or hierarchically by region and country from the “browse” tab. The new interface will also include browsing by sub-region. Each culture is represented by a 4-digit alphanumeric code; for example the Ganda culture is represented by FK07. Users do not strictly need to refer to the OWC to search eHRAF however; the small number of cultures represented in eHRAF means it is fairly easy to select these from the scroll-down box. The new interface promises to automatically link search words to the relevant OCM or OWC code. Choosing terms from the thesauri should then be less necessary, though HRAF representatives recommend continuing to use the OCM codes for sophisticated searching. The simplest way to use eHRAF is to browse by culture. For example, a user seeking material on the Koryak culture, an aboriginal population in Siberia, can hit the browse tab and either find “Koryak” in the alphabetical list or browse geographically, going to Region: Asia, then Country: Russia, Culture: Koryaks, RY04. Upon opening the Koryak culture file, as with every culture in eHRAF, the user finds a file description, a file table of contents and a cultural summary. The file description summarizes materials in eHRAF and in the microfiche set and gives the publication date of each. The file table of contents is simply an author/title list linking to the source materials. The cultural summary will be especially appreciated by students, as it provides an encyclopedia- type introduction to each culture. In this case, the cultural summary includes alternate names (“ethnonyms”) for the Koryaks, notes on their location, language, history, religion, economy, kinship, settlements, and other cultural details. In fact, many of the cultural summaries have been adapted from the “Encyclopedia of World Cultures” (Boston, Mass: G.K. Hall, 1991-1996). Cross-cultural searching in eHRAF is considerably more difficult. The researcher who tries the search tab is confronted with a search form in three parts. The top section requires an OCM code. The center section is for full-text keyword searching. In the third section users can search or limit by culture. To take advantage of eHRAF subject indexing, the use of the three-digit OCM subject codes is required in the present interface. The OCM code list is linked next to the search boxes; a pop-up box offers the same choice of alphabetical browsing or hierarchical browsing available from the “Browse Subjects” screen, though the pop-up hierarchical code list is of little use since the codes lacks labels. Up to three codes can be chosen with the present interface but this number will not be limited in the new interface. For example the researcher could search for taboos on personal names by choosing OCM 551 (Personal Names) from one of these lists; the usage notes explain that 551 would be a better choice than 553, which is for the bestowal of names in infancy. Although the center section of the search page allows keyword searching in eHRAF, this is actively discouraged in the current interface. Since keyword searching bypasses the strength of HRAF—its indexing—this is discouraged by labeling the search box “exact word or phrase.” The “Help” and “What Word to Choose?” links both lead to a lengthy explanation of the shortcomings of keyword searching. The new search interface, eHRAF World Cultures, promises to include both a basic and an advanced search page. 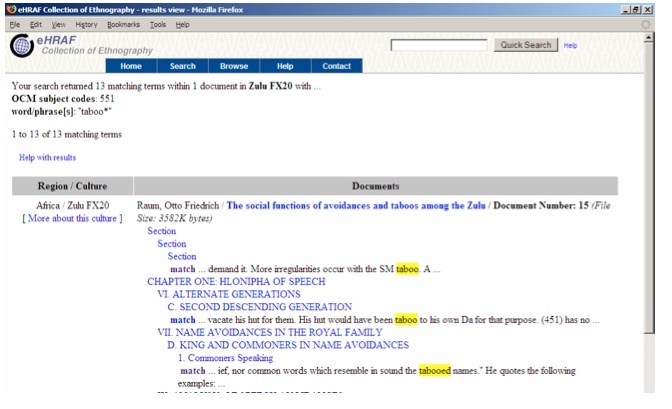 Basic search will include an “eHRAF Search” feature that links search words to the OCM and OWC codes automatically. The advanced search page will allow Boolean searches of an unlimited combination of subjects, cultures and phrases. In the third search box, cultures can be chosen singly or in multiples (using ctl-click) from the scroll- down list. The default is to search all cultures simultaneously. Alternatively, users can go to the browse tab and browse cultures alphabetically or geographically, as described above. For all search types, results of over 100 hits have an unnecessary speed-bump: the system will ask if the user wants to continue. Once subject codes and cultures are entered in the search boxes, the search is executed very quickly. Search results are organized by region, and within that alphabetically by culture. The number of paragraphs and documents containing that concept are given for each culture. For example, a search on the concept of taboos on personal names (OCM 551) across all cultures reveals 7,173 paragraphs from 917 documents that include this concept. A researcher trying to identify a culture for whom this is a very important concept might observe that eHRAF contains 355 paragraphs from 15 documents in the Zulu culture file (FX20), but only one paragraph from one document about naming practices of the Koryak culture (RY04). Each hit in the results view displays a list of documents in brief citation format. The document list does not include the date of publication, nor can the results be sorted in any way. For example, if the search brings up a list of 18 documents, the user may need to try them all to locate the most recent document on this concept. Each document title links to second list, this time of numbered matches of hits within chapters, each leading to a paragraph containing the concept being searched. The numbered links themselves give no information at all, so again the user may need to try them all to find the most relevant results. Thus, a search with many hits may require four intermediary screens before an actual document is viewed. In cases where one document contains many matches, the user will want to go to the chapter or section heading in order to read several matches in context. Thankfully, searches resulting in only one match link to the document immediately, bypassing intermediary screens. Clearly a “keyword-in-context”-type display would be far better than the present arrangement for some of these intermediary screens. For each source document, a complete table of contents appears in the left side-bar. The OCM codes being searched are displayed at the top of the page and are highlighted in the text. Two or more search terms highlight in different colors. For ease of reading, it is possible to turn off the OCM codes and simply read the text as an e-book or article. Documents are mainly in HTML with some graphics and cover pages provided as GIF files, but there are no PDFs. Helpfully, original page divisions are clearly marked throughout eHRAF, allowing users to cite documents as if they had seen the original. The help file provides suggested language to include in the citation to acknowledge eHRAF as the intermediary source. As the HRAF representative suggests, a narrower search can be performed by doing an OCM search limited by selected keywords. For example, the same search of OCM 551 in the top search box and with “taboo*” as a keyword (the asterisk is used for truncation in eHRAF) results in only 160 matches from 72 documents. In this search, only one of these is on the Zulu. In contrast to the previous search, these results appear with search terms in context for easier selection. The document source list (“eHRAF Source Bibliography”) can be searched alone by author, title, and keyword in the abstract. In the present interface, however, results cannot be sorted, complete citations are not given, and there is no way to export results. The new interface promises to remedy the latter two of these shortcomings. As mentioned earlier, indexing in HRAF is unique and wonderfully granular in that every paragraph of each document has one or more OCM code assigned to it. In this age of keyword searching, students in particular may find this system to be archaic and cumbersome. Anyone who has ever seen the LC “see references” for a cultural group like the Yanomamo, however, will appreciate the need for a controlled vocabulary when searching for ethnographic material. The thorough notes and cross-references in the OCM thesaurus also testify to the complexity inherent in anthropological research. The double thesauri system with indexing at the paragraph level, often with several OCM codes assigned to a single paragraph, allows for cross-cultural comparison as in no other database. Even products like ISI’s Social Science Citation Index are limited to the keywords supplied by the author and in the article abstract—a far cry from the level of indexing offered in HRAF. eHRAF has help pages both within eHRAF and through links to the HRAF Web site. Although extensive, the help files are not especially well organized and do not have a search feature. Since the initial search screen is not user-friendly, results screens are not obvious and the help section is voluminous, users may well give up before they actually find a relevant document in eHRAF. If it performs as promised, the new search engine should clear up much of this confusion and make eHRAF far more user-friendly for the novice. The eHRAF help section includes a tutorial on how to search HRAF. The HRAF home page also includes a guide to how HRAF can be used in teaching, complete with sample exercises. Customer service representatives are very helpful and sometimes attend ALA and ACRL conferences. Tutorial sessions are available to member institutions via telephone with speaker-phone. Most documents in eHRAF are complete and in full-text. At present eHRAF has no download options however, and printing is limited to a screen print of a single section or chapter. The only alternative to this would be to copy and paste individual passages into a word processor program. The new search interface promises to include the ability to print, download and e-mail search results, but downloading and printing will still be limited to 10 paragraphs. HRAF is the only database to provide full-text primary source materials for anthropology, world- wide in scope, and with paragraph-level indexing to allow for cross-cultural comparison. Even when some of the source materials from eHRAF eventually appear on the Web as the result of mass- digitization projects, nothing will replace the thorough subject indexing provided by HRAF. 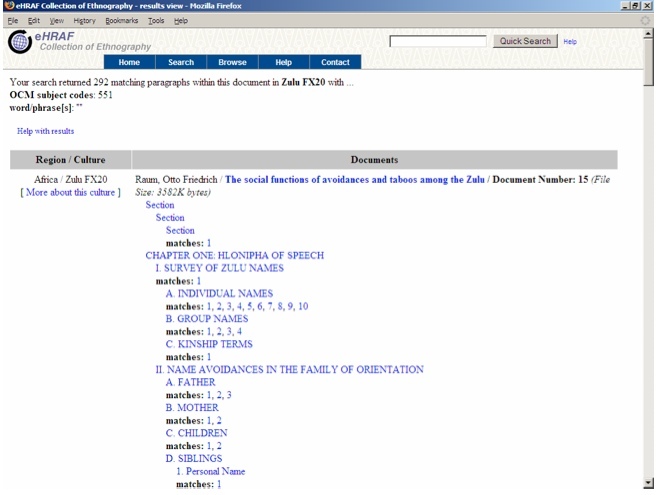 Some other databases overlap in that they contain selected primary source materials (such as Facts On File’s American Indian History Online), and also index journal literature or provide introductions to various cultures, but as a collection of indexed, full-text ethnographies, HRAF is unique. The content and indexing of eHRAF is not only unique, it is tailored to experts in the field. Yet even undergraduate students can find helpful introductory material browsing by culture, and will find useful introductions in the cultural summaries. No researcher would want to use eHRAF as their only source of information on a culture, but eHRAF is an excellent place to start for those cultures included in the product so far. For cross-cultural comparison HRAF is indispensable, and a literature search reveals that many academic articles do cite HRAF as a source of information for this type of research. HRAF fills an information gap by providing ethnographic data in context, but at present it may be difficult to convince library patrons to even try it. The main drawback of HRAF is the difficulty of use for the newcomer. Students may be frustrated by the steep learning curve required to search eHRAF, only to find that the database contains a relatively small number of cultures. HRAF as a whole (the microfiche and the database together) is a unique product, but to use it effectively requires a great deal of knowledge about how and why it was created. This should not be the case. The digital conversion of the fiche set planned for completion within five years, including updates and omissions of outdated material, should do much to improve this database. Many searching and download problems are expected to improve with the new interface, but export and printing options for the full text will still not be possible; these are features that students have come to expect in a full-text database. Several important improvements have been promised in the near future with the new interface, but with so many electronic products available to students it will be an uphill struggle for HRAF, and any librarian who wishes to recommend eHRAF, to convince patrons to try this database when other more intuitive products are available. To provide a product desirable to libraries and their users HRAF should be more usable as a full- text archive with stable links and MARC records to individual works provided by HRAF itself. After the microfiche conversion, or perhaps simultaneous with this effort, HRAF should concentrate on updating the culture files with more recent material. The continuous addition of more cultures will undoubtedly be expected by subscribers also. Finally, all changes to the interface should be rigorously tested by way of usability studies with librarians, anthropologists, and especially, with students. Cunnar, C. “Emails to Library Contacts at HRAF Member Institutions Sent January 13, 2005.” http://www.yale.edu/hraf/mbrlib011105.htm (accessed June 15, 2007). Ember, C. “Expedited Conversion of Microfiche Culture Files.” HRAF News: The Newsletter for HRAF Members no. Fall/Winter (2005-2006): July 6, 2007, http://www.yale.edu/hraf/newsletterfall05.htm. HRAF, “Help Files for eHRAF.” http://ets.umdl.umich.edu/e/ehrafe/help/help.html. HRAF, “Human Relations Area Files Collection of Ethnography (Choice Outstanding Academic Title) (May 2005 — Installments 1-53).” List of cultures in HRAF, including dates of coverage, number of documents and text, and installment number, http://www.yale.edu/hraf/CCL/HRAFCollectionList2005.htm. HRAF, “Human Relations Area Files: Cultural Materials for Education and Research.” http://www.yale.edu/hraf/. OCLC, “EHRAF Collection of Ethnography – (EHRAF).” http://collectionsets.oclc.org/SetInfo.jsp?SetSymbol=EHRAF .